The other day I got a text message that read: the tables are in the driveway; and I immediately hopped in my car and drove over to my moms to pick up my grandparents set of Lane tables. Unfortunately in order to have these now I have lost three family members, first they were my grandparents and most recently my uncles. 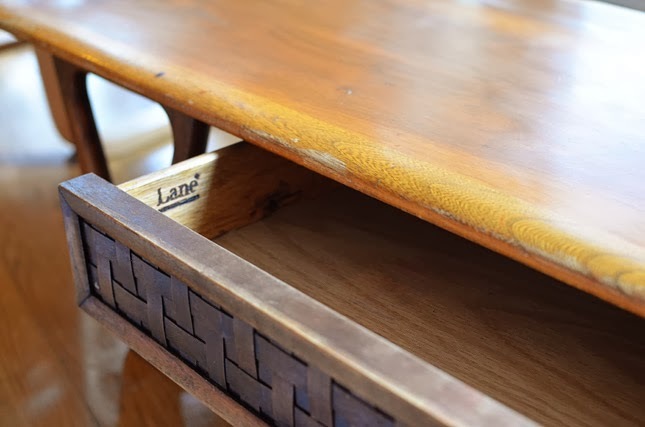 This is one of those moments in blogging where one part is my story, but the other part isn't my story to tell, but I will say my uncle passed away very recently and that is one part of the story of how I came to get these tables. His passing was the sort that was both surprising (he was young, only 14 years older than me) and not surprising (addiction), but it was most certainly very sad. And, well, that is the sad part of this story, but having these tables is a very happy reunion for me and they remind me so much of happy times spent with my family. These tables are a danish modern design from Lane's 'Perception' series which were produced in the late 60's and designed by Warren Church. I love the triangular legs and basket weave facing on the drawers. You can see the same side tables I have here (i haven't brought them inside yet so no photos of mine). I remember these tables from as long as, well, I can remember. The coffee table was the center of many birthday parties and gingerbread house making and puzzle building and yatzee playing. Toddlers were propped on it and whooshed across it's slick top from one family member to the next. When I was little my grandparents were not big into change so they had this furniture from before I was born until they passed away. And it always looked brand new. 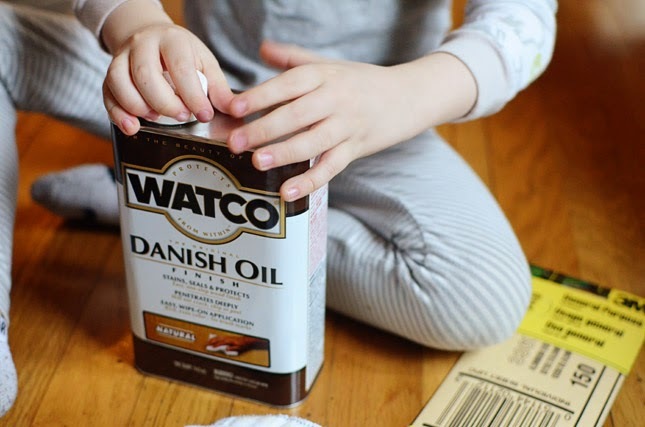 When I was a kid I loved to get out the murphy's oil and clean and polish them until they could blind you with their shiny surface. I'd sit on the floor and trace my finger along the inside of the triangle legs while watching tv. And one of my favorite past-times was looking in the drawers. Like I said my grandparents weren't big on change so I'd open the drawer and find the same trinkets in there over and over and over again. My grandfather's old smoking pipe paraphernalia, many years after he'd given it up was still in there (which i kept and plan to put back) and his union cards and playing cards, matchboxes and keychains collected and forgotten about from trips my grandparents took to Las Vegas, and I had a little tin sucrets box with some trinkets I had collected in there too. I'd sit down and go through all the little findings and breathe in the scent of the drawers. I did this every time I went there, or everyday that I spent there, without fail even as I surpassed being a kid. Things changed but that never did. 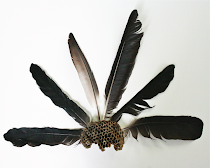 It was like I knew I needed this ritual to someday give me the visceral memories I draw from today. The tables aren't in as bad of condition as I thought they may be in, but they are going to need some work and one of the side tables is in particularly rough shape. They smell pretty strongly of smoke and a few of the dings and scratches didn't improve after my attempt to do little light sanding and danish oiling, so with that I think I am going to have to sand the table tops and re-stain them, eek! And while it will be very un-purist of me, I would be okay toning down the orangeness in them. Tomorrow I need to do some storage space sorting to store the side tables in, unfortunately I don't have any space right now for them to fit either there or in my house. But I have been thinking about rearranging my living room, for, um, the first time ever, so I am hoping soon I can make at least two of the three fit. I am also hoping this post will serve as my before post. If anyone has any recommendations on which stain to use I am all ears, choosing wood stains is not one of my strong suits. P.S. I promise I don't let my children play with chemicals, it took me an hour to get that stupid cap off and because Milo is so very strong and has really big muscles, you know, he needed to try. Christine, I'm sorry to hear about your uncle but glad that the tables and part of your family found its way back to you. I look forward to how these tables will look refinished and I'm sure all types of new memories will be made with them. M does have super strong muscles, momma's helper already! i am so sorry to hear about your uncle. i have two young family members dealing with addiction and i don't think they realize how many years they can be taking off their lives, and this affect on others. hugs. 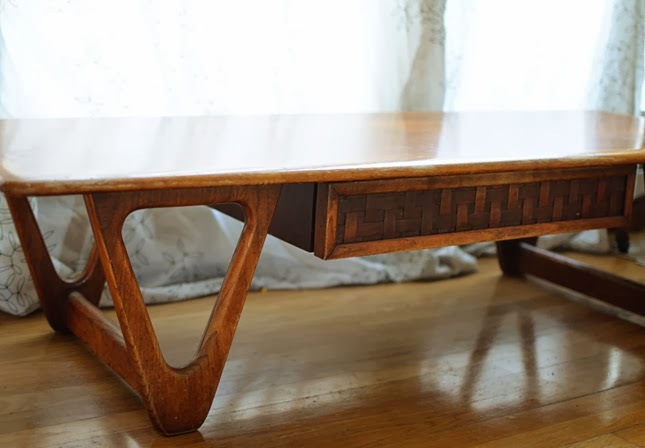 as for the tables, this one with the triangle legs are really gorgeous. 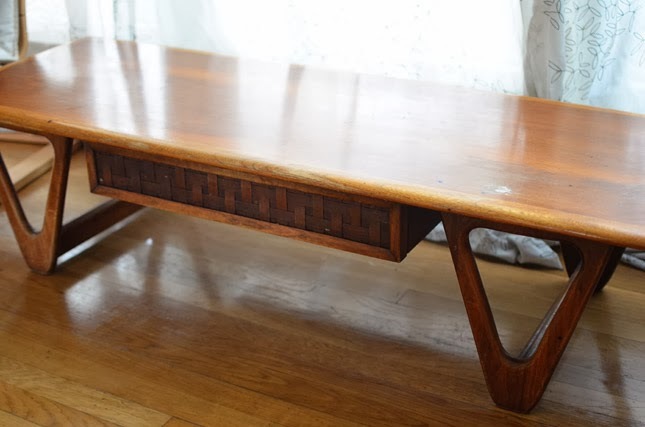 you know i'm a sucker for anything mid century and especially anything vintage with a memory, like this piece. thank you so much. i wasn't particularly close with my uncle (especially in the last several years) but he was apart of my immediate family and we definitely have a lot of shared history. i am so sad though that he's left behind his kids and grandbabies. that's tough. my heart is really going out to them right now. Oh such a moving story and such a lovely, lovely connection you have to your past (It's so helpful that it's a good-looking connection, right?). It's heartbreaking to read about the loss of your uncle, especially such a young man and such a tragic way to die, but you've found a light-filled way to honor him, and that makes me so happy. oh, thank you. yes, i have a few other things but these are something i would actually buy for myself today, so it does have that extra bonus. it's always so hard when someone dies in such a way because you know they were living in pain. whether it's someone i know or love or a stranger, that always breaks my heart. lol, your last line made me laugh... those tables are beautiful. a piece of your family's history. I sometimes wish I had kept more of my grandma's furniture. ugh, there are some things i kick myself for getting rid of or i didn't take care of, or i didn't know to take them at the time . . . this kind of makes up for that. i am actually at the age where i can care better for them than i was when they passed. so in that way it's kind of neat i got them now. i will certainly take care of them so they can stick around a long while. You are gifted storyteller, Christine. I hope I will read a book of yours one day. 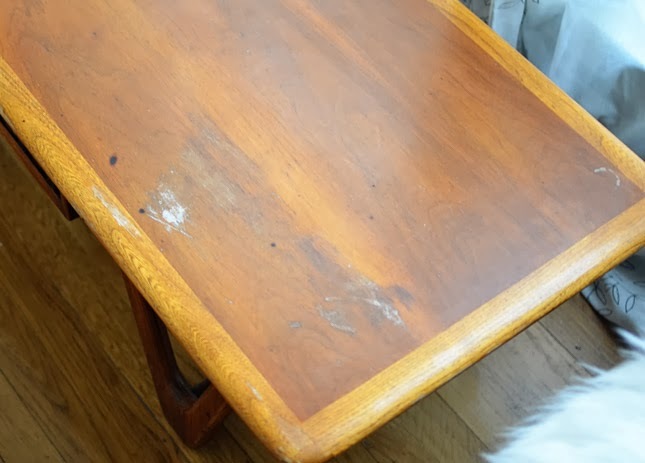 :) Unfortunately, I don't have any tips on wood stains, but the design of that table is so interesting and I just know it will look so much better after your reconditioning. i definitely want to keep it as close to original as possible, especially because i don't want to refinish the legs : / too much work! but the top is more orange than the body, so i am going to try to match it to that. it's nice to have things that have memories attached because you get to add to them and it feels like a continuum. it is a lovely thing. I'm so sorry for your loss, but happy that you have such a beautiful piece to cherish and bring back memories - love having pieces that have special meaning in my home. Can't wait to see it refinished!! thank you. i hope i can refinish it really well, i am a little nervous, but at this point they need it, so i must! i'm sorry for you loss. but you have to keep a piece of them with you. that table is so pretty.